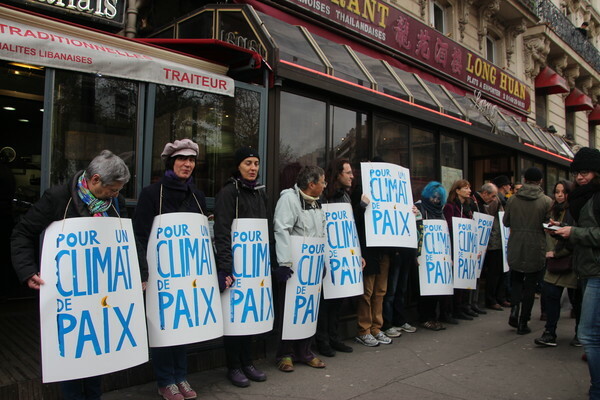 Today I observed and sometimes joined a peaceful human chain for a climate of peace on the Boulevard Voltaire in Paris. Organisers estimated about 10,000 people participated in one way or another. This event took place because Parisians and visitors to Paris were denied the freedom of speech and assembly to march down the street under the state of emergency provisions. These provisions were enacted by the French state after the terrorist attacks on November 13 which resulted in 130 deaths and over 300 injured. It caused a dark cloud to hang over the climate conference. 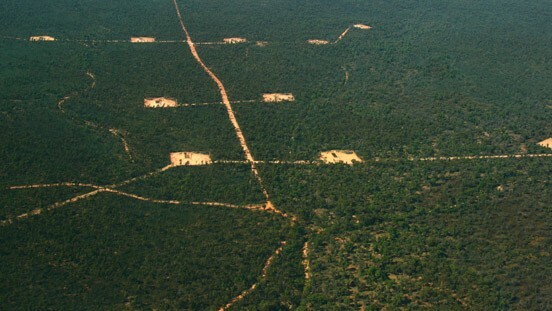 Just the fact that national leaders focus was redirected on security and terrorism has detracted from the much needed focus on resolving the climate change issue, which activists have highlighted as the Climate Emergency. 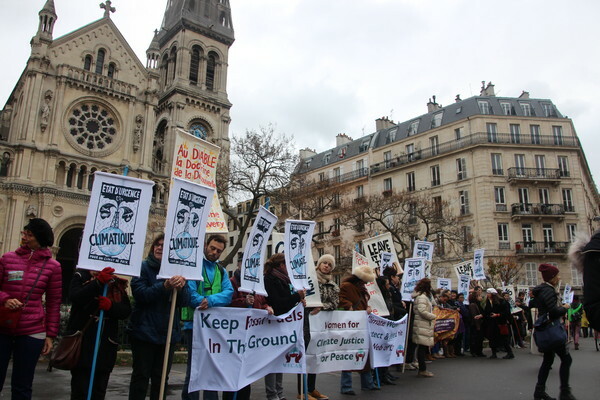 When I left Australia I was expecting to attend two huge people’s climate mobilisations in Paris: one on November 29 and another on December 12. I was expecting to march with hundreds of thousands of people down the Boulevard Voltaire to send a strong message to the leaders and diplomats attending the UN Climate conference, COP21. After the attacks, there was doubt whether France should continue with the climate conference, but those doubts were quickly dispelled. In France a state of emergency was declared and extended. Mass street protests were prohibited. That meant the months of work put into the two planned mobilisations, part of global peoples climate marches, was all for nothing. The Government would not even consider protest organisers compromise suggestion of a static rally in a stadium where security could be supervised. Yet the state has allowed football matches to proceed, and Christmas markets to continue. A double standard to soften if not dispel the voice of the public in Paris on climate change while diplomats decide our future. So activists vowed to mobilise, but through more creative forms of protest, that perhaps push the limits of the prohibitions. 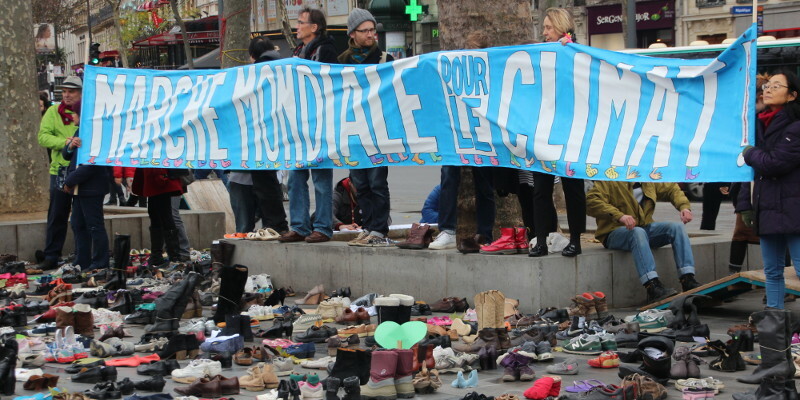 Hence the visual metaphor of 4 tonnes of shoes, 22,000 pairs, in the Place de la Republique, in recognition of all the 400,000 marchers that had been expected but could not march and were silenced by the state of emergency provisions. Even the Pope and UN Secretary General Ban Ki-moon donated shoes to the visual installation. Activists went a step further: they organised a human chain of people standing shoulder to shoulder on the sidewalk down Boulevard Voltaire, the route of the march. The chain did not start too close to Place de la Republic memorial or around the memorial to the Bataclan theatre, where 89 people were killed, out of a sense of respect and opprobrium. I walked down the line for several blocks, past the Bataclan theatre, but not all the way to the end. People held placards, banners, sang songs, made speeches, street theatre, participated in waves going up and down the line. Organisers used bicycles to ensure the chain remained peaceful, intersections open to traffic, and that people organised according to the non-violent principles stipulated. A marching band went up and down the footpath entertaining the human chain. At one point a guitarist sang Bella Chaio, with the people around joining in. Further along, a rapper entertained the crowd. The crowd was diverse. Many Parisians, but also people from around the globe, some like me definitely here for the UN climate Conference. Many of the signs demonstrated that tackling climate change was important for tackling issues of equality and poverty, food and energy, water availability, jobs, safety and human rights. Some emphasised the importance of moving to 100 per cent renewable energy for reducing climate impacts and providing new industries and employment. They all emphasised the need for climate justice and the importance of scaling up climate action. 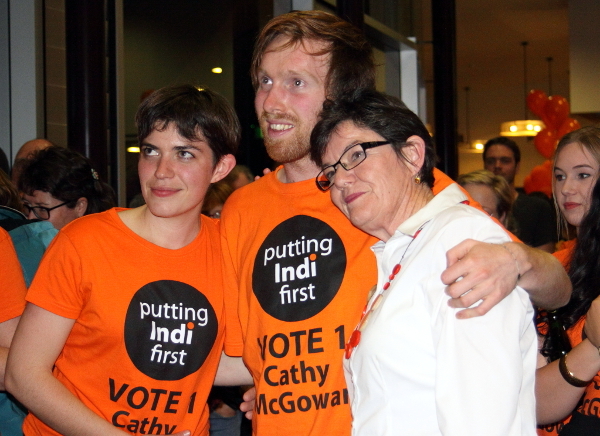 Many people just wandered down the footpath, like me, sometimes participating or photographing and moving on. 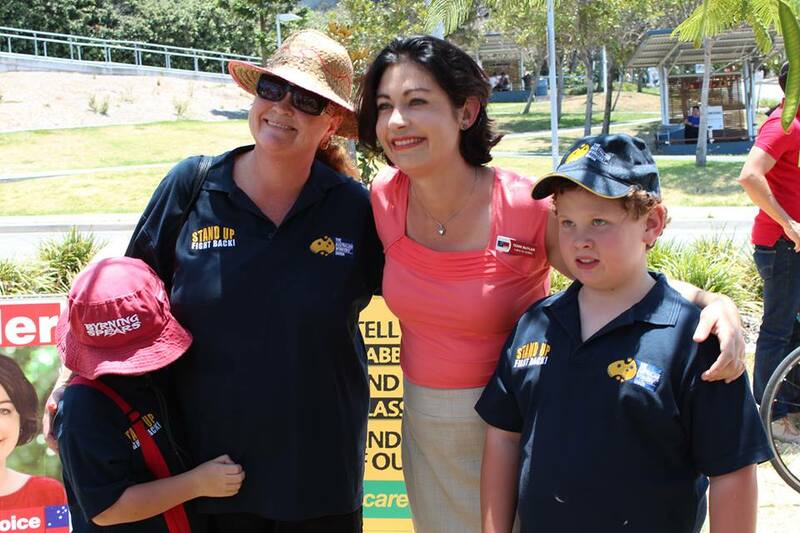 Organisers estimated that 10,000 people participated. While it was hard to estimate from any one vantage point, clearly the numbers stretched well above several thousand and much more than some conservative and inaccurate reports of just 3,000 people. By 13:00 the event was over and people from the human chain disbanded and drifted off. I noticed walking back to the Place De La Republique a greater police presence. There was more of the CRS riot cops on the streets and in the side streets. The crowd at Place De la Republic had also changed subtly. There were a few people with masks, and definitely more tension in the air. That was when I decided to leave with my friend and 15 year old daughter. I don’t know who escalated the confrontation between police and the new protesters, and maybe it is a confrontational approach by both that escalates a feedback situation with each side goading the other. Later that afternoon I was not surprised to here of battles with police and tear gas, the kettling of a group of protestors in the square and arrest of about 100 people. The state prohibition on street protests certainly was a factor which antagonised the more militant anti-capitalist activists. And it is far more complex than just to blame the demonstrators. 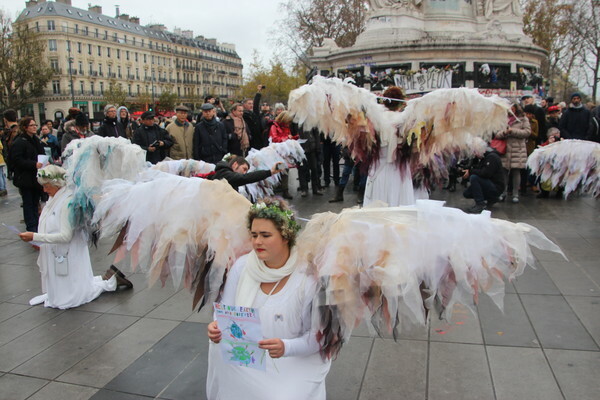 Paris riot police found climate guardian angel wings can be very eye catching during confrontations. 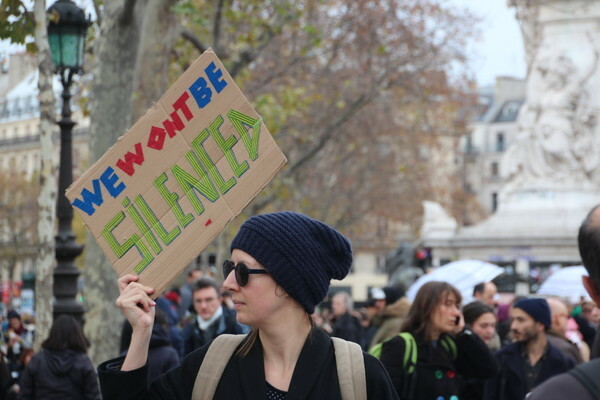 So while climate protests remain contentious in France due to the state prohibition on street protests, over half a million people marched peacefully around the world for climate justice and increased climate action. Records were broken in more than 10 countries which saw their biggest-ever climate marches. In Australia some 140,000 people marched, including 60,000 in Melbourne, 45,000 in Sydney, 10,000 in Brisbane, 8,000 in Perth, 7,000 in Adelaide, 6,000 in Canberra, 1,500 in Hobart, 600 in Darwin and in many smaller rallies from Bendigo to Cairns, Margaret River to Wagga Wagga. This follows a recent survey by the Lowy Institute showing that a majority of people want Australia to lift our cimate targets. India also had mobilisations of about 140,000 people over the weekend. Over the Tasman Sea in New Zealand some 33,000 people marched in 35 events. The largest was in Auckland where 15,000 people marched. Another 8,000 people hit the Christchurch streets and 7,000 Wellingtonians marched on Parliament at lunchtime. Smaller rallies in Dunedin, Hamilton, Nelson and other regional towns. New Zealnders are well aware that New Zealand has set an abysmal target and could ramp up further emissions reductions. Britain held it’s largest climate protest in London with over 50,000 attending, but also many smaller marches from Edinburgh to Reading. On the continent there was over 20,000 in Rome (Italy), over 20,000 in Madrid (Spain), over 10,000 in Copenhagen (Denmark), over 3,000 in Athens (Greece), over 5,000 in Geneva (Switzerland), and over 2,000 in Vienna (Austria). In the Philippines some 15,000 people marched in Quezon City, a part of the greater Manila urban area. A further 2,000 people marched in Tacloban that was devestated by Typhoon Haiyan. The message is clear: people want climate action and are showing this on the streets and with the wide support of transition to renewable energy away from the heavy subsidisation and support for fossil fuels. A world powered by 100 per cent renewable energy is possible, is already being brought to fruition in thousands of projects big and small, and is already inevitable. Our leaders and climate negotiators have an opportunity to choose to stand on the right side of history and give the transition an effecive boost at the Paris moment, the UN climate conference. Which world leaders will step up? China has promised to make every minute and second count to reach a climate deal. Indian Prime Minister Narendera Modi has already announced the launch of an International Solar Alliance at a press conference for Monday afternoon in conjunction with President Hollande. Will new Australian Prime Minister Malcolm Turnbull make substantive policy announcements? or go with existing policy positions? Perhaps a fancy speech articulating a slight change in emphasis delivered with much more style, but with little substance? Read Marc Hudson’s backgrounder on Australian Prime Minister’s and climate change. See photos in my Flickr album from my walk from Place de la Republique along Boulevard Voltaire, including of the very moving memorials to the Paris Attacks.